Question....how do the Pilots come back from such an emotional and physically draining win against BYU to play USD on Saturday at 1 PM in front of a much quieter group of UP fans? USD will be a disappointed but confident team after their narrow loss in Spokane on Thursday evening. It’s going to be tough for the Pilots, but with only three more home games this season…they’re going to have to win them all to give themselves a shot at 6th place or better heading in the WCC Tournament. It’s going to be up to those who attend the game to do all we can to generate some noise Saturday. Remember, there will be free kid tickets (6th grade and below) in general admission and 2-for-1 tickets in all price levels for others. It's too soon for Las Vegas odds on the game, but Pomeroy picks the Pilots by 6. If the students turn out again, the Pilots fans might be just as loud. Most of the noise against BYU was from Cougars fans. In USD’s 3 point loss in Spokane last night, junior Johnny Dee was nearly perfect for the Toreros. The junior guard scored a game-high 26 points on 8-of-10 shooting and was perfect from the free-throw line (7-of-7) and from three (3-of-3). Senior Dennis Kramer chipped in ten points to go with his seven rebounds. The Toreros were able to open up a five-point advantage midway through the first half, but GU responded with a 17-0 run and never relinquished the lead. USD remained within striking distance throughout the second half, and they were able to tie the game at 55-55 with 5:55 left. However, they could only score one more point as GU held on to stay undefeated at home on the season. In addition to some sharp shooting by Dee in USD’s 59-56 loss, USD played some lock-down defense holding the best offensive team in the conference to 22 points below their season average and to 2-of-11 shooting from 3-point range in the second half. Besides Dee and Kramer, and junior guard Christopher Anderson, a USD player who has done well against the Pilots in the past is the “other” Dutch product by way of Canarius, Jito Kok. At 6-9/235, Kok has limited UP’s bigs in the past…..let’s hope the Pilots can go inside to Thomas, Riley, Voldy, and Ryan on Saturday night. San Diego is a lot better than their WCC record (2-6) would indicate. For the Pilots to win they’re going to have to get back into that “big game” frame of mind, limit their turnovers, and go back to their normally very good free-throw shooting. Will the student section show up for a Saturday afternoon game? It could make all the difference! DoubleDipper wrote: Question....how do the Pilots come back from such an emotional and physically draining win against BYU to play USD on Saturday at 1 PM in front of a much quieter group of UP fans? I'm more worried about us old folks being able to recover. I can't do 3OT's any more. Is that what's known as hidden value? Team needs to heed Rev's comment on how the win compared to the Zag win and a caution after the game. The guy is a poet. PurpleGeezer wrote: Team needs to heed Rev's caution after the game. One evident truth as we approach the half way point in @WCChoops play is "if you don't get better, you get beat" Improve and survive. I think anyone that's halfway paid attention this year would have expected nothing less than a tight one today, and it's playing out like that so far. Hopefully they can avoid a big USD run coming out of halftime!!! p.s. that wasn't Riley Barker leading the fast break, was it?? Big man moving like a young, uhh, Michael Holton out there! Alec wasn't in the process of shooting when the whistle blew? Wow. I think the more relevant question is not when the whistle blew but when the foul occurred. I think a case can be made that Alec was fouled sufficiently before the shot that the ref made the right call, but I am not sure the ref got it right . . . perhaps the shot should have counted. Alec had a tough game. The front end of the one and one he missed after this whistle no doubt was just part of his frustration during the game. They were holding Bobby Sharp all day but it was called only once. This was a winnable game. Stonehouse wrote: Alec wasn't in the process of shooting when the whistle blew? Wow. I thought it was an "and one" watching it live and I have watched the Root TV replay and Stoney's replay a couple of times each now and still think its an "and one" call. One of the referee's signaled to count the basket and Tony Padilla overruled him. How Tony could take points off the board in that type of situation is incomprehensible! BYU finally beat us. The guys were a step slow a lot, and missed several shots at the rim, that I attribute to tired legs. Riley Barker did a good job, but it was clear Thomas was too gassed to come back in late in the game. I would of liked to have both of them available for rebounding on the Wintering free throw at the end. Can't blame the refs for any loss, especially when we miss our free throws. Very difficult to drop this winnable home game. It was a tough ask playing the Saturday afternoon after a Thursday night triple-OT thriller. That one final call didn't decide the outcome of the game. But, man, what a call . . .
VillaGorilla wrote: Can't blame the refs for any loss, especially when we miss our free throws... That one final call didn't decide the outcome of the game. Oh I agree. We made plenty of mistakes today. But you can't argue that, had the call gone our way, we would have been shooting a free throw to take the lead with 10 seconds left. As it stood, we had to make two in a one-and-one situation just to tie it. The difference between the pressure on a player - especially a freshman - is significant. Maybe this call didn't decide the outcome (San Diego would have still had a possession before the final buzzer), but it very much impacted Portland's chances to get a win. No question Dave Libby is doing his job. PurpleGeezer wrote: No question Dave Libby is doing his job. Being so sure that the home team doesn't get "homer" calls that you actually end up totally favoring the road team? Yeah... that has Libby's stink all over it. According to the play-by-play on the UP website, we missed 11 layups in today's game. At the close of the non-conference slate I predicted on this board that our tendency as a team to miss lots of layups would cost us games once we reached the conference schedule. Forget the awful call by the ref on Wintering's basket at the end of that game. Those 11 missed layups were the reason that we lost. UP was the only home team to lose on Saturday. DeanMurdoch wrote: Hopefully they can avoid a big USD run coming out of halftime! 13-3 run for San Diego to start second half. The warm milk at halftime tradition needs to be eliminated. Agreed and I would suggest holding back on the turkey smorgasbord too! 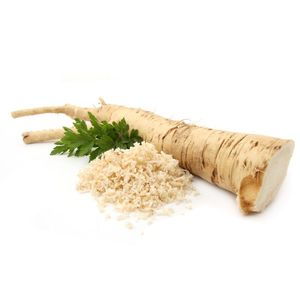 Substitute a spoonful of ground horseradish root.